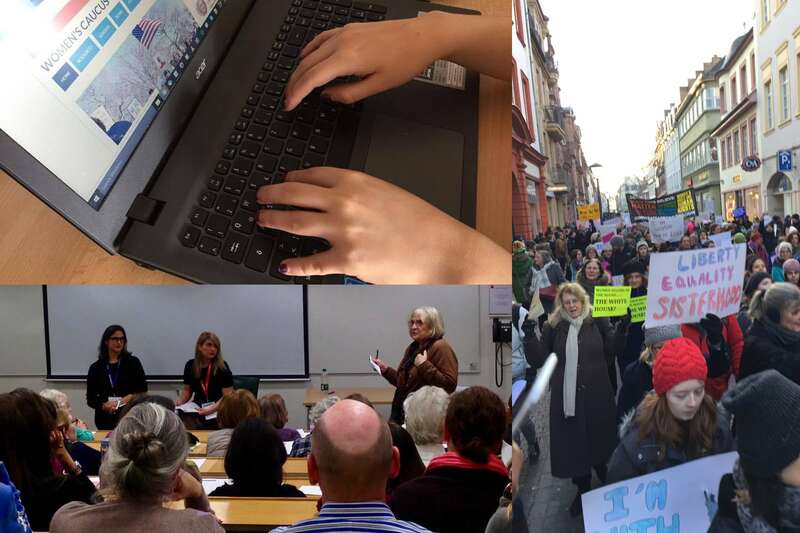 Our Global Women's Caucus is helping American women around the world to become real activists in the struggle for our rights no matter where they are, no matter how small or large their numbers, a committee of one or a hundred! Whether you are a single soldier with a laptop on a base in the middle of the Pacific or a busy professional in a major city, you can help with the important work we do. We strongly encourage membership by all genders because Women's issues impact all of us. Through participation in our caucus activities, you too can help us make a difference for women, whatever your skill-set and wherever you happen to be. Opportunities to participate in our caucus are as varied as our members. Information, guidance, and ideas for local activism based on the many issues that affect women. Through our monthly newsletter and special event mailings, Facebook page and Website we announce regular "calls to action" such as targeted letter writing, call-storms, and local protest gatherings. In-Person get-togethers such as workshops, panel discussions, and special guest events. Watch our Website Events Page for an event near you. Our Wiki library of Ready-to-go “events in the box” materials to help you plan your own smaller-scale events. Global town hall-style meetings and Webinars with speakers from groups such as Planned Parenthood, Emily's List and members of Congress. Input from all participants is encouraged. Here is the place to speak up and share your ideas! If you have a particular skill or project you’d like to work on, let us know! We alternate meeting times to accommodate our many time-zones. Wherever you are, you can volunteer to work on one of our global teams. You could work on our communications team, help do research on women’s issues and pending US legislation, join our event planning team, or suggest a special project you’d like to work on. Drop us a line. Form a section for their own chapter: We encourage groups of any size to get together and start planning events for their own chapters or precincts. They can check the Women's Caucus Wiki section for tips on how to start their own caucus, and what they might do for their first activities. Sponsor a workshop weekend on any number of topics and invite members from all over. Offer home-stays when possible. An event like this can electrify and unify your entire chapter! We can help you! Lobbying, interfacing with State-side legislative councils and activist political groups. Managing their own Website, Facebook page, Twitter, Podcast. And finally, the easiest and most important way to be an activist member of our women’s caucus is simply to register to vote at www.votefromabroad.org. and tell everyone you know to do the same. That is what will finally bring the transformation we are fighting for!